skin cancer, disney princesses, and summer improvement projects. I decided in May to title Summer 2011: Summer of Project. I have a whole slew of projects to complete before August 1: Day of Dreaded Return to Work arrives, and they run the gamut from home improvement to personal care to hobby building to relaxation-focused. Right now, for instance, I am doing a hobby building and relaxation-focused project. This is my version of multi-tasking, the only kind that doesn't make me a ball of intense nervous tics. In other Summer of Project news, I've completed Melissa's bedroom. This was an important one, because way back in Summer of 2008: Summer of Pregnant and Swollen, I had this Big Nursery Vision. It was going to be HGTV fabulous. A little girl's nursery, but without all that stupid princess frilly bull$h&t because if there's one thing I can't stand, it's princess frilly bull$h&t. I think it totally sends the wrong message to little girls. That, and the color pink. Pink as a general accent in a room, here and there, or maybe paired with a strong color such as black or brown, but those full on, pink-on-pink rooms? With frilly frou frou princess poop on top of it all? I think you're just rolling out the red carpet for a future visit from Anorexia Nervosa, who's just a ridiculously inappropriate houseguest. So back to 2007: I had an HGTV vision. 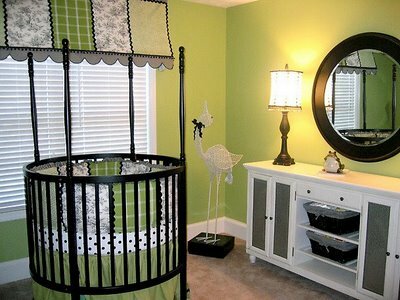 The room would be soft jade green, with black and white accents. It would be soothing and inviting and feminine but none of that frou frou princess b.s. Then I hit a roadblock: I couldn't get the guest bed out of the room. We need a guest bed (doesn't everyone?) and the only area we had to accomodate it was Melissa's room. (Later, we would buy a red sectional for our living room, and my husband--who insists he does not but I suspect he has a touch of packrat to him, just as I suspect he's voted Republican in the past--couldn't part with the brown leather sofa from that room, and so miraculously, he made room in the office for the guest bed so we could store the brown sofa in M's room). In addition, my HGTV green jade/sooth ing nursery had a circular, black wood crib in it. Which only cost about $1000 (weddings, babies, weight loss, and funerals: industries that want total financial control over the world). And telling my packrat-esque husband how much we'd need to budget for a crib made him laugh and laugh (his original proposal was that Melissa sleep in a nightstand drawer in our bedroom) (I'm actually not making that up, and yes, he was serious). But then my sister in law had a neighbor who needed to unload her natural wood crib and was willing to do so for $30, and that was that. And then I got put on 4 weeks' of bed rest. And then a newborn entered my life. And once a newborn enters your life, you can just stick a fork in it and forget it. So for the first 2 1/2 years of her life, Melissa slept in a room that was supposed to be jade green (that looked oddly leprechaun green), with cream/white/black/natural wood/a hodge podge of other rainbow colors accents that made absolutely no sense whatsoever. And one queen sized guest bed with faux suede material that was eventually replaced with a brown leather sofa. And some odd pictures I slapped on the walls in haphazard fashion. Basically what I'm saying is: I had a poorly thought-out and barely formed plan, and I am no HGTV Design Star. The other thing I slowly realized about 1 week into living with a newborn was: this kid doesn't give a flying flip about what this room really looks like; she just wants to feed and sleep and poop tar-like substances. She also didn't have a personality, strong likes or dislikes, and preferences. But now I got her number--over the last 2.5 years, as Melissa develops her sense of the world, who she is, what she likes (popsicles, ice cream, lollipops, Nick Jr. 24/7, and splashing in water fountains) and what she dislikes (green beans, broccoli, bed time, our cat's "sharps"--her word for claws, hair wash nights, and not getting her way), I realized: I didn't need any stinking HGTV inspiration picture! I could create a private sanctuary for an up-and-coming, headed-into-terrible-3's small girl all's by myself. I knew, for instance, my kid likes pink in small doses (thank god), but she's all about the purple. I know she thinks Dora the Explorer should be running this country and making all the rules (be thankful for Barack Obama, even if you're not). And so I ran with that--I mean, I'm cool with purple. Purple is the color of mystery and magic, wisdom and ambition. Purple is the color of independence and creativity, all things I feel peopl e who like to watch a lot of Nick Jr. and other tv programming probably need lots of. And though I really hate when that Dora theme song gets stuck in my head for hours, I'm cool with Dora the Explorer as a role model for girls--she's plucky, spunky, but also really thoughtful and kind. And she has a monkey side kick and those two are always solving problems, defeating evil, thinking outside the box, and helping the environment every now and then. WAY better than those suspicious Disney princesses. I have other home projects I'm completing, but I'm getting help with those. We're purging closets, for instance (this has occasionally been difficult for C, though it was his idea. I had a pile of stuff headed to Goodwill, for instance, and he reclaimed at least 2 things from it) (which I say is pretty good for someone who, for 6 years, held onto a most hideous monstrosity masquerading as a coffee table with storage bins, insisting it was good for "storing fishing tackle and stuff"). And we're replacing our unimaginative foyer and dining room lights. And we're adding a backsplash to our kitchen walls. (I'm actually not doing any of these things--just running the credit card through machines at stores selling us the project materials...and using the word "we" a lot). But I also decided to visit some doctors, just to check up on myself. Make sure my 39 year old body's systems are all functioning properly, with no signs of decrepit mold and such. Because I faithfully visit the girl parts doctor every year, but I avoid the other body parts doctor like the plague (heh). I think I've avoided for so long because I'm nervous--have been nervous for awhile--about my blood sugar. Type 2 Diabetes runs in my family, both sides but strongly on the maternal side (which has also given me the genetic potential for bad back health, female pattern balding, and clinical depression. Thanks, maternal ancestors!). So I stole my husband's doctor (because he's been seeing Dr. S for years and raves about how fabulous Dr. s is, and when I googled Dr. S., random people have felt so strongly about him as well that they've taken time to review him on the internet. And these people all go on and on about how Dr. S missed his calling as a super hero rock star, and so I stole him. Without shame or guilt, I stole my husband's doctor. And when Melissa is old enough, she will steal him too. ( Dr. S really is THAT good--let me know if you'd like to steal a family practitioner, too). So my blood work looked fabulous. My body is working well, I have absolutely nothing wrong with me internally or externally. Other than needing to lose weight, I am the poster child for what a healthy 39 year old chick is supposed to look like. So I went to the dermatologist to get a professional opinion on my worry spots. Ironically (or not), my worry spots were nothing to worry about. Who knows what or where the mark under my right knee came from, and dermatologist Dr. M says the red spot on my chest is totally normal. An age spot (no! no! I cannot have something called "an age spot" Dr. M! Because Dr. S says I'm the poster child of picture perfect 39 year old healthy woman! Dermatologists can be such party poopers). But my back was a veritable plethora of worrisome spots. Three moles were removed from that area, plus one from my right thigh. Dr. M thinks that one of the worrisome back spots is probably basal cell carcinoma. Which, as far as cancer is concerned, is the type of cancer you want (if, for instance, you're the kind of person who wants cancer). It can be disfiguring, depending on how deep it's gone into the skin and how much skin they have to remove around it, but it doesn't travel into the body like Scary Melanoma does. And so this health summer project has been both: WOOO! but also: Poop. I haven't heard back from Dr. M yet about whether I need to be worried about any of the other spots, or if that one spot definitely is basal cell, but thank goodness I found it at 39 instead of, say, 59, when the basal cell could have spread to my whole back and/or turned into Scary Melanoma. I think what I'm going to sum up this blog post with is: Skin cancer and pink and Disney princesses=kind of the same. Best to be avoided, but good to realize their impact well ahead of time if you haven't known beforehand to avoid. And stay out of Lowe's, Home Depot, Target, and chi chi lighting stores. You'll have zero dollars for Starbucks runs.